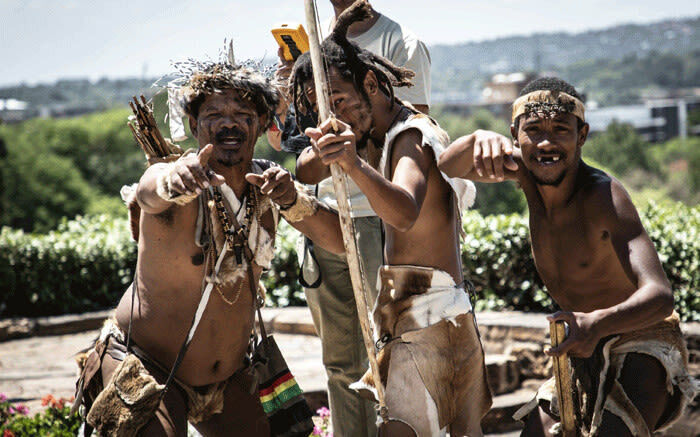 FILE: Khoisan activists have returned to Union Buildings to demand feedback after handing over their memorandum to President Cyril Ramaphosa last year. Picture: Abigail Javier/EWN. Members of the Khoisan community are camping out once again outside the Union Buildings in Pretoria. The group is awaiting feedback from President Cyril Ramaphosa after handing over their memorandum to him last year when they camped outside the buildings. The spokesperson for Chief Khoisan SA Royal Council, Annette Vorster, confirms the group known as 'The Khoisan Six' continues to camp out on the grass. Up until this point the president has not met with them yet. She says the meetings with representatives from The Presidency is not sufficient and the group wish to hand its notice of memorandum to the president personally. The demands have not changed since last year, she says. They are asking that the word 'coloured' be removed from all government documents and replaced with the word 'Khoisan, they are demanding a return of their identity back, to be recognised as the first nation of South Africa, and that the 1913 land claims be backdated. The Chief Khoisan Sa himself said if by 1 January 2019 the Presidency does not go down to the Khoisan Six, the Khoisan will govern themselves. She says a plan of action has been implemented if the president does not meet with the group by the deadline. Professor Richard Calland looks into the viability of political parties entering into an alliance after elections.